Buyer is responsible for tracking items through shipping websites and calling appropriate shipping company to inquire about package. Buyers will receive an email with tracking numbers once item is shipped. Please do contact me. I definitely will be willing to work with you after you have called USPS about your package wearabouts. Thank you!3 inch wide tie. Note* the snails may not be perfect in the middle. If you would like to make sure it's perfectly in the middle please message me! I ship orders out in 1-2 days. I use USPS First class (3-5 days) to mail items. If you need it express or priority mail 2-3 days please message me for extra shipping charges. Beautiful tie! 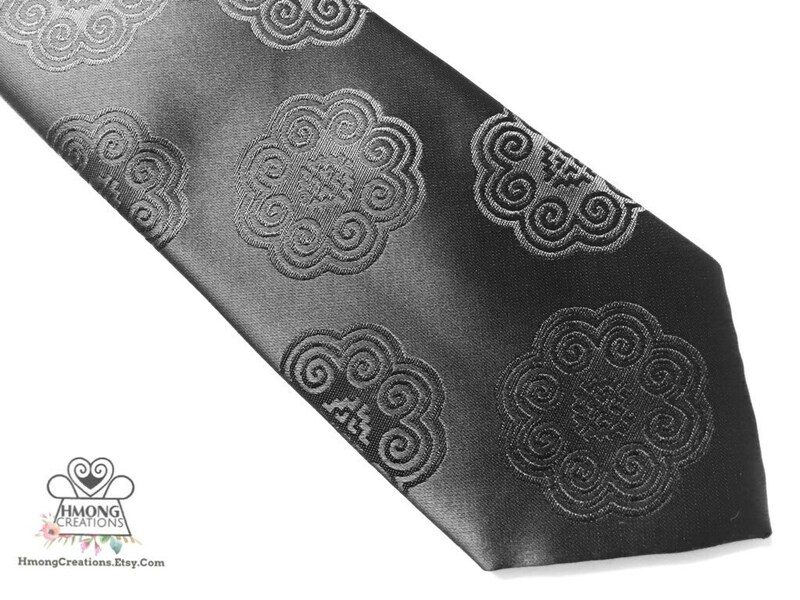 Can't wait for my husband to wear it on our wedding day since he wanted a Hmong inspired tie! I ordered the tie and tie clip together as a gift for my dad and it looks amazing! Shipping was fast. Items came unharmed. Beautiful. Thank you! This tie is beautiful. It’ll be a gift for my dad. Definitely a great gift !! Send me a photo of using/ wearing on of my products product you'd be okay with me sharing on social media and using and receive free shipping with a coupon code will message to you. 👉Purchases from Etsy VARY! Please read each description in Etsy. You might receive multiple packages for 1 order depending on what is ready first. ❤️ some listings have “ships in 2 weeks” in the title | leggings, shirts, women dress, pillows, mugs, baby onesies, etc... These will take 2-7 days for production and take an additional 7-10 days for arrival. Plan for 3 weeks for you to receive them. ❤️Most other items on ETSY (anything with Hmong trim or jewelry) I ship in 2-3 days and you will receive in 3-5 days. 🔵⚖️Return, exchange, and refund policy. 🔅No refunds, exchanges, or returns. please message us for any quality problems and we can come up with a solution.